With technology playing such a major role in our daily lives, disconnecting from the online world once in a while is always a good idea, and should even be part of our travel routine. One great way to completely unplug is to go off-grid by surrounding ourselves with nature. 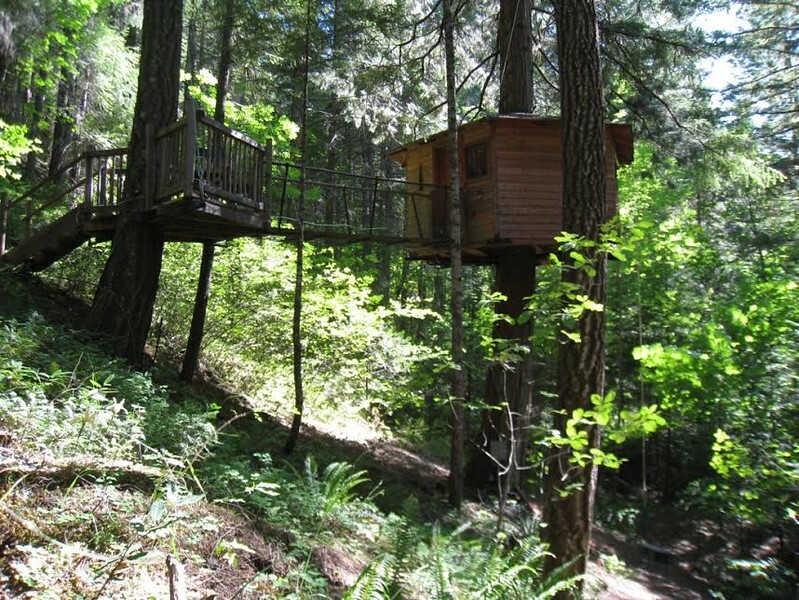 And although there are many types of luxury lodgings that can do just that, today’s guest contributor, Suzan L. Jackson from Book by Book, is here to take us back to basics with a peaceful treehouse stay deep in the Oregon forest. The treehouse is high off the ground for the most part, but accessible through a small walkway on the other side. What could be more romantic than spending the night in a secluded treehouse high in the trees with your partner? Instead of waking up and checking your email, here you can just look out your expansive windows and check out the beautiful greenery, birds, and blue sky, surrounded by natural beauty and peace. Back to basics never looked so good! 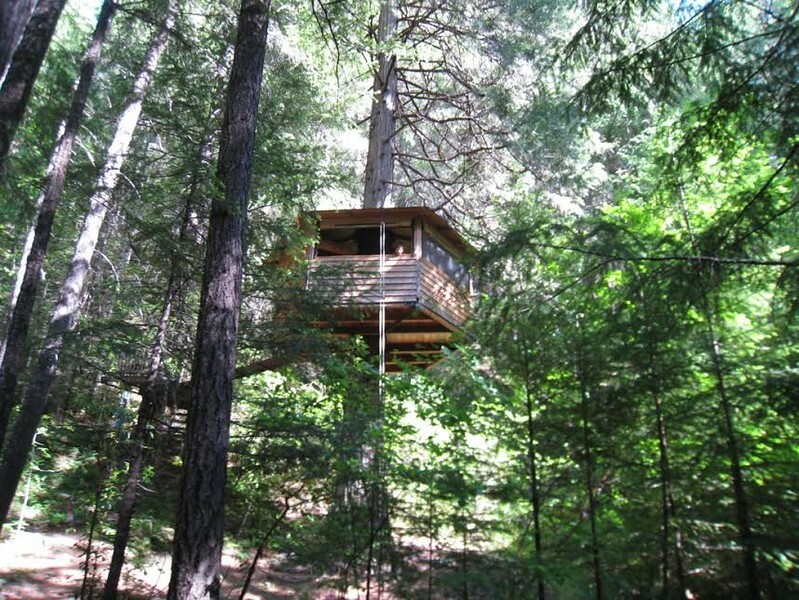 One of our favorite vacation stops was spent staying two nights at The Lilly Pad Treehouse in Cave Junction in southwestern Oregon. This gorgeous, private treehouse is located about a mile down the road from Out ‘n About Treesort, a creative, stunning collection of assorted treehouses that each sleep from 2 to 4 people. The Lilly Pad was built by the same people and is officially a part of the Treesort, but it is located by itself on the property of its host, Sandy Lilly. The Lilly Pad can sleep up to five people, but being on its own away from the activity at the main treehouse resort, it is ideal for a romantic getaway for two. In addition to its beautiful and unique accommodations, Sandy also offers a delicious homemade breakfast for her guests each morning. Getting back to nature is a great way to disconnect. The treehouse itself is a sight to behold. Located high up a tall tree, it is still easily accessible to guests because of its location next to a hill. Guests walk partway up the hill, then cross a short bridge to the Dutch door. Through the door is everything you need: a comfortable queen-sized bed, a small fold-away table with two chairs, a mini fridge and coffee maker, and even bunk beds in case you bring the grandkids along (our two sons loved staying here when they were younger). And yes, to answer the first question on everyone’s mind, there is even a small bathroom behind a curtain with a flush toilet and a sink with hot water! The treehouse is compact, but comfy! You can haul your bags up to the treehouse with a pulley system so you don’t have to carry them up the hill (though it is not a large or steep hill). Up in the treehouse, the trunk of the tree is at the center of your room, with nothing but treetops and sky outside your screened windows. Back down on the ground, you’ll find a nice area with an outdoor kitchen, showers, spot for a campfire, and chairs and hammocks. We cooked a simple dinner for ourselves when we stayed there and enjoyed the comforts of the campfire area. And in the morning, just head into Sandy’s beautiful home for one of the best breakfasts you’ve ever had. 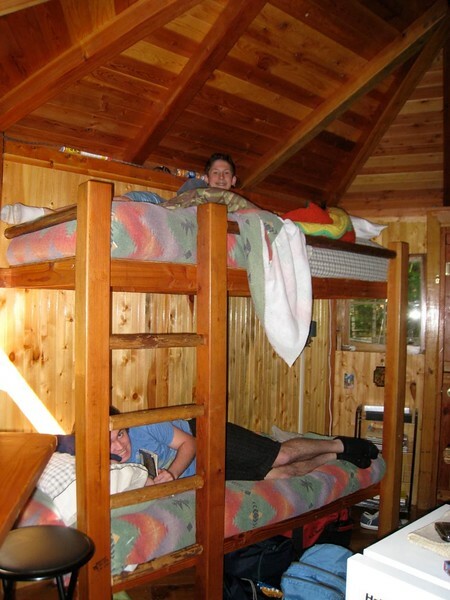 Who doesn’t love bunk beds? All of this is surrounded by trees: quiet, secluded, and peaceful. However, if you’d like some activity, it’s just one mile down the road at the main Treesort area. They offer river rafting trips, hiking, horseback riding, arts & crafts classes, and ziplines. When we visited with our sons, we signed up for the ziplining course and had a blast gliding through the air from some of those tall trees. The resort even offers periodic workshops on tall tree climbing, treehouse building, and zipline construction, if you want to learn how to do it yourself (believe me, after staying in a treehouse, you will want one for yourself!). 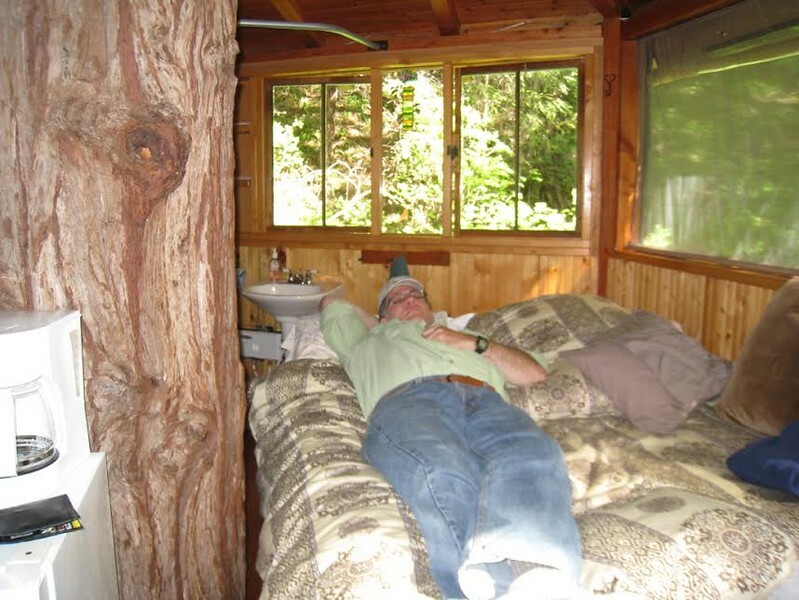 If you are looking for a unique place to stay or are sick of the same old hotel rooms, come to Oregon and discover the pleasures of falling asleep in a tree. Staying at The Lilly Pad is the perfect romantic getaway for two or a great place to take the entire family. Either way, it is a unique experience that you won’t soon forget! 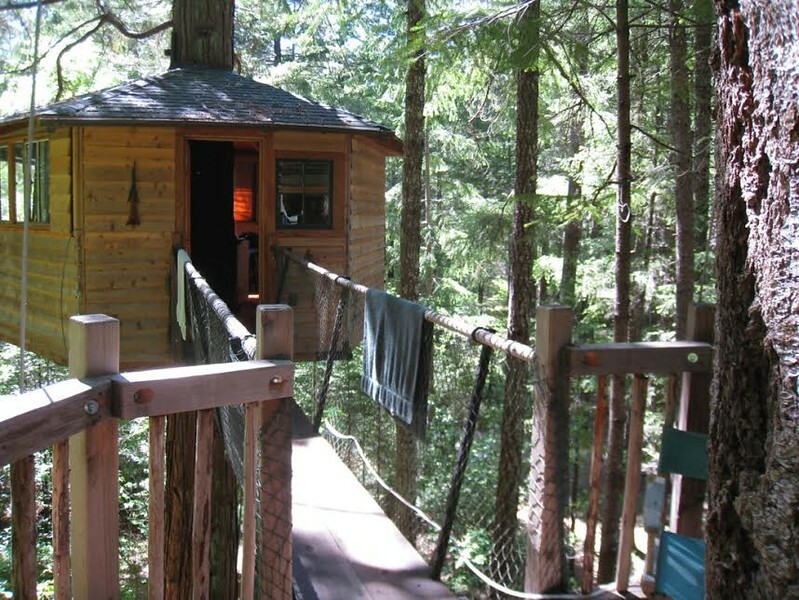 Have you stayed in a treehouse before? Come join the conversation at the My Itchy Travel Feet page on Facebook. Or send us an email with your thoughts. Suzan L. Jackson is a freelance writer in Delaware who specializes in topics related to travel, outdoors, family, health, and pop culture. She writes a blog filled with reviews of books, TV, and movies, as well as travel photos, at Book by Book and you can follow her on Twitter at @SueBookByBook.